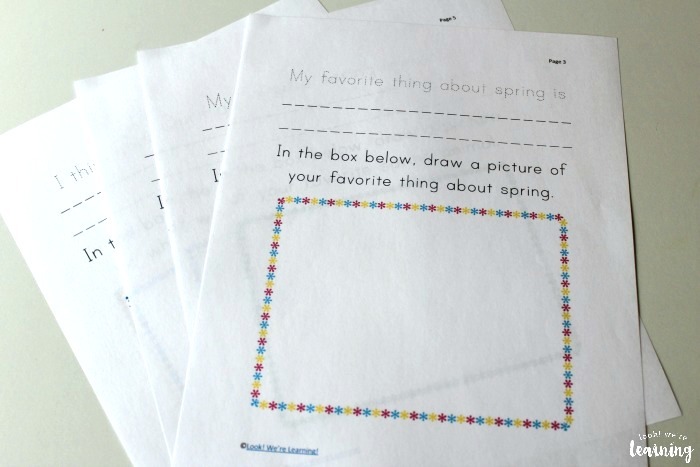 Printable Spring Preschool Story Prompts - Look! We're Learning! Piglet and I have been working on her handwriting and phonics skills for months, so I thought she’d have a little fun trying her hand at creative writing. And spring is a great time to be creative! 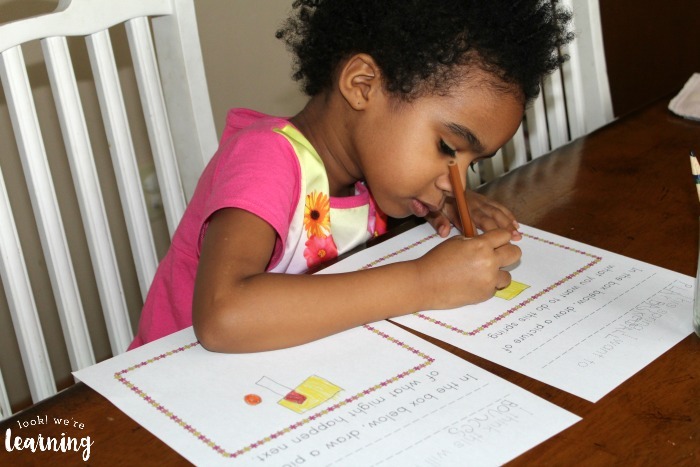 Naturally, I thought she’d enjoy some of her own spring worksheets for kids: these new printable spring preschool story prompts! As an English major, creative writing is one of my passions. There’s just something about putting pencil to paper (or fingers to keyboards, these days) and starting off down a road of creative thought. You kind of have an idea of where you’d like to go, but you’re always surprised at the things you come up with along the way. 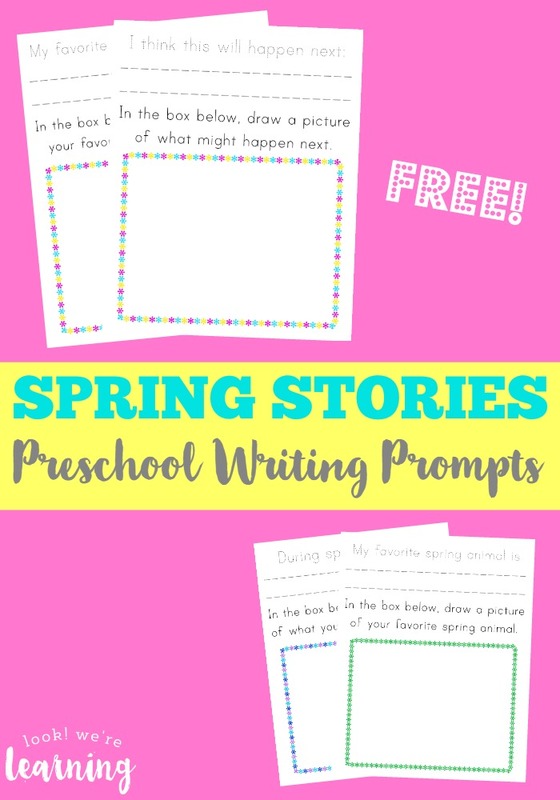 Helping kids learn to write about their thoughts and guesses at a young age is a good way to help them write without fear later on and these printable preschool writing prompts can help! 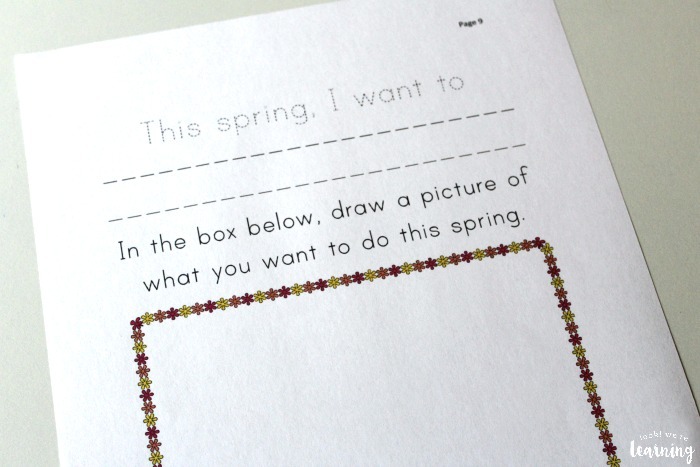 Read on to see how to get your own copy of these spring writing printables! And, for more spring learning fun for preschool, don’t miss our Birds and Bugs Playdough Mats for Preschoolers! 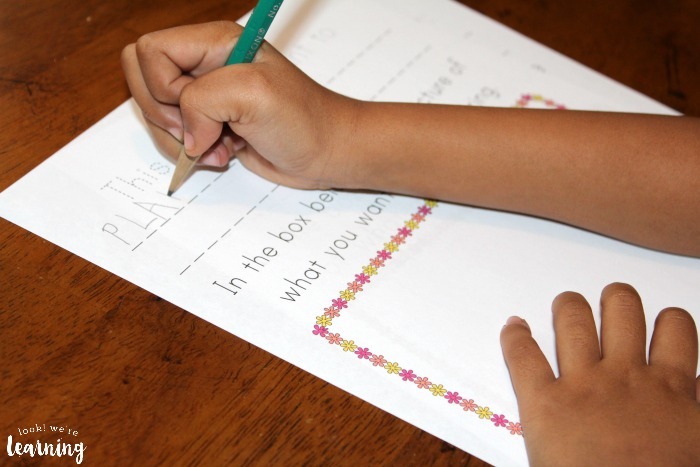 The prompts include four different scenarios for preschoolers to write about. 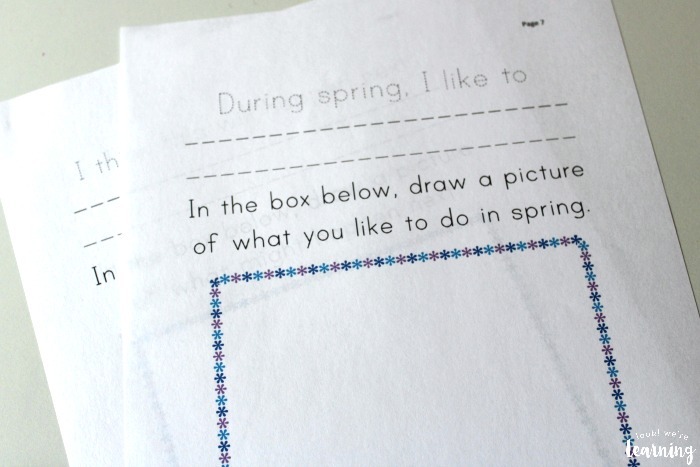 They can write and draw about their favorite thing about spring. 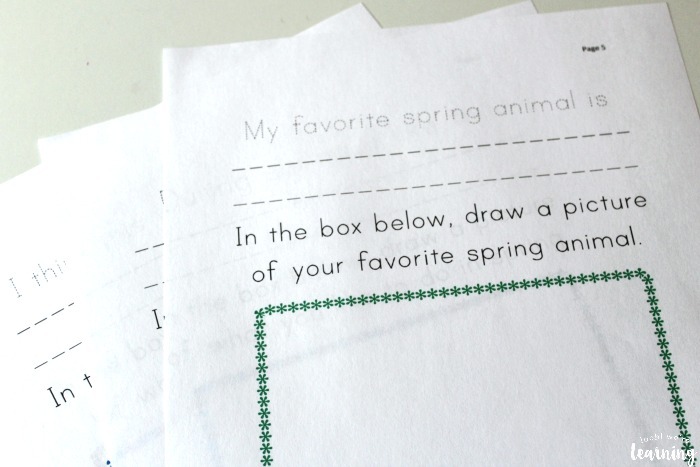 They can write and draw about their favorite spring animal. They can express what they like to do in spring. 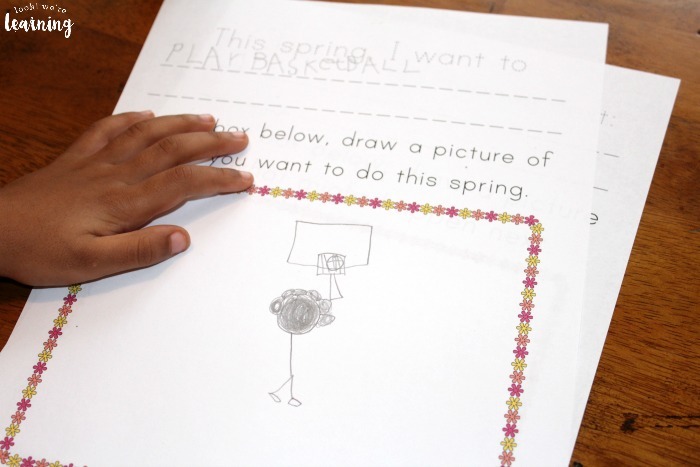 And, to get more specific, they can write or draw about what they want to do this spring. Plus, they can draw a picture of what they think could happen afterwards. Let’s see these in action! 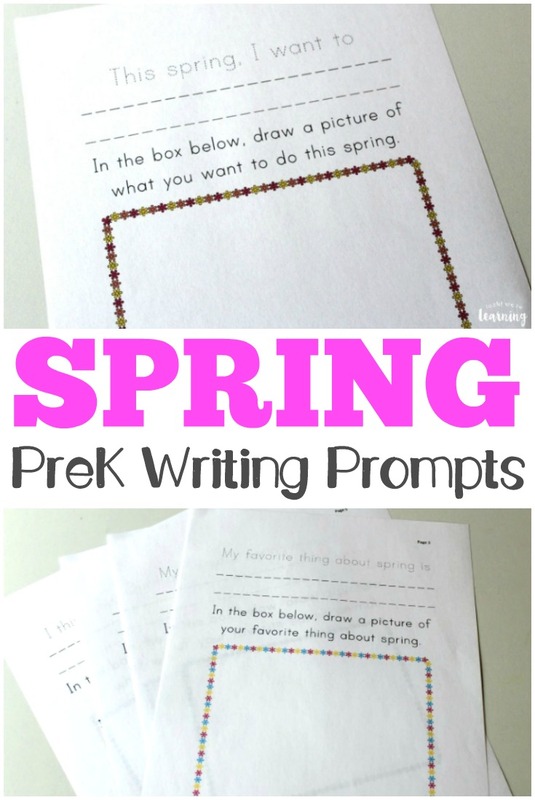 Each prompt has a line for kids to finish the sentence. At the bottom, there’s a box for them to draw a picture of what they wrote. This spring, Piglet wants to play basketball. That’s her shooting the ball into the hoop in the picture. I will say that I had to read the sentence out to her and help her spell the words. The rest she did herself. 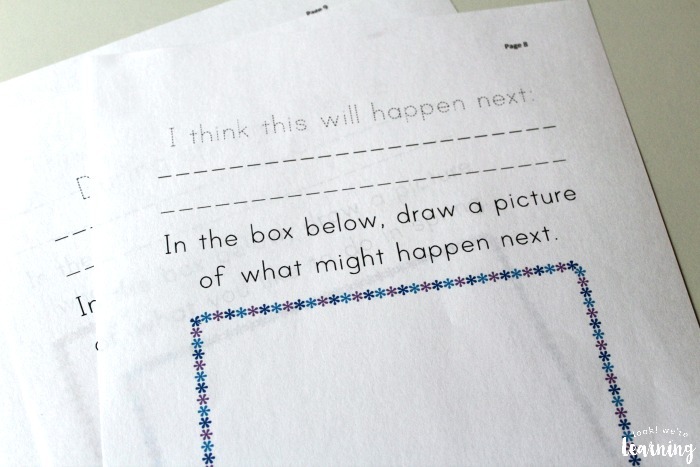 After each initial prompt is a second page asking kids to write what they think will happen next. 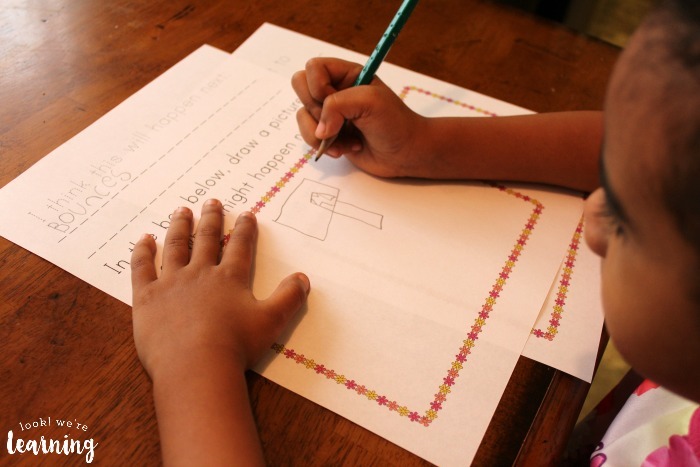 This is a simple way to introduce creative writing to preschoolers: ask them to come up with an image and then predict what might happen afterward. 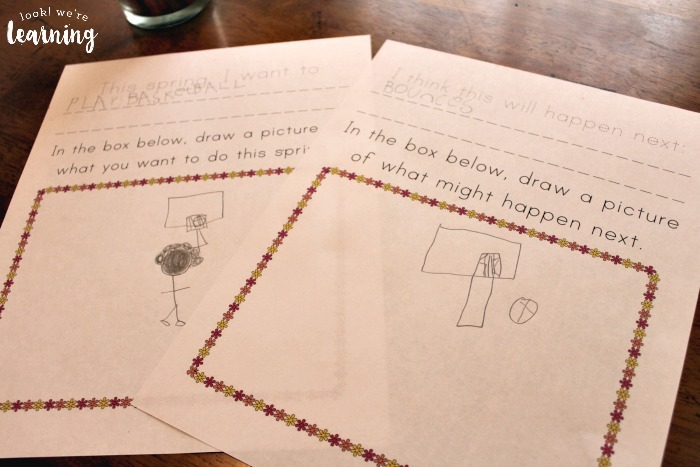 Piglet’s answer to what will happen after she plays basketball was: “Bounces”. Naturally, she drew a picture of the ball bouncing after falling through the net. Hmmm….what to do next? Color the pictures! And that’s what she did. 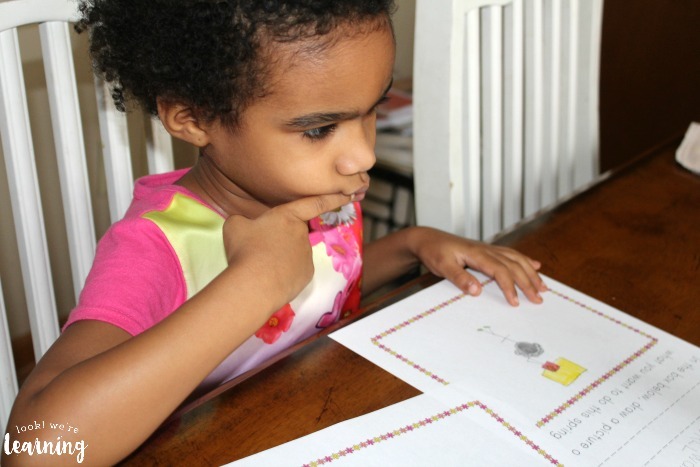 She was so proud of her work that she gave her masterpieces to her older siblings. 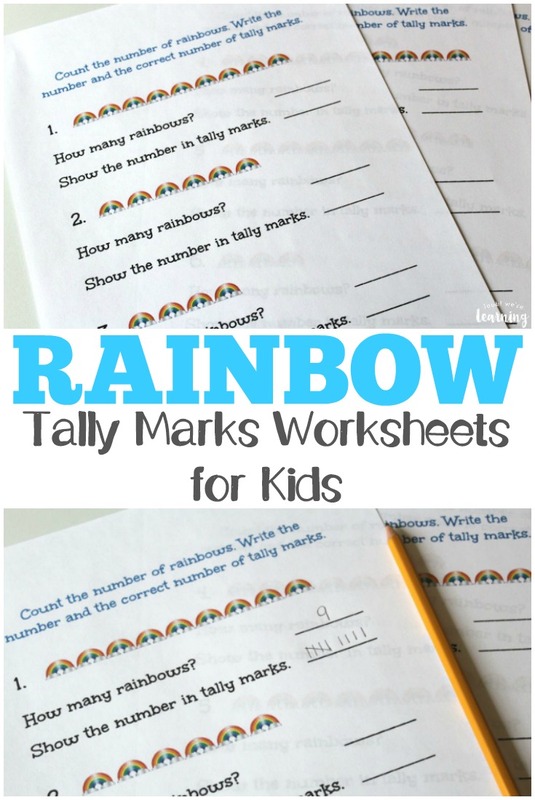 This was a fun (and quick) language arts lesson for her. 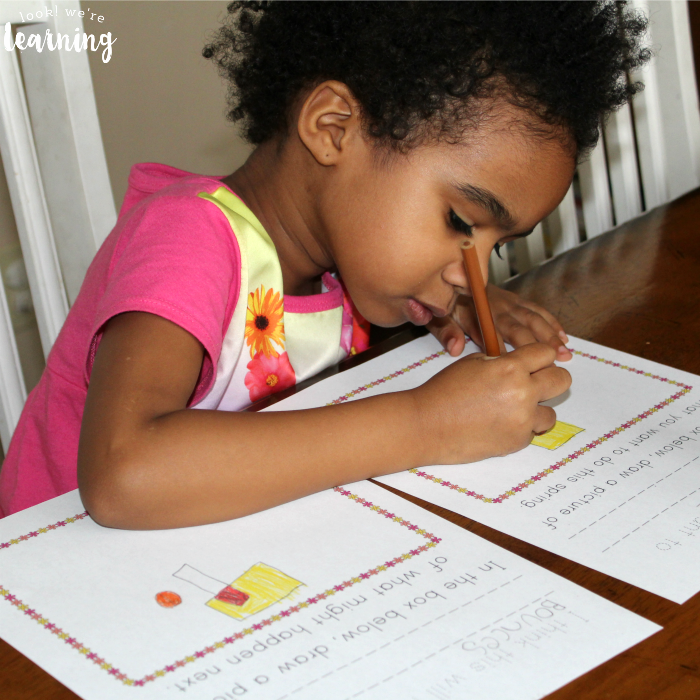 We spent about 15 minutes on one of the prompts and she got to practice handwriting, creative writing, art, phonics, and spelling – all in one activity! 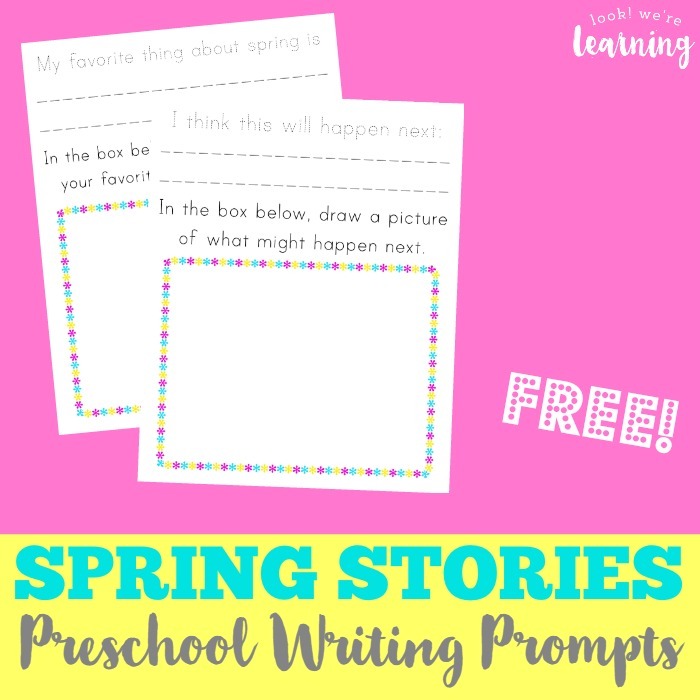 Scroll down to get your printable Spring Preschool Story Prompts! 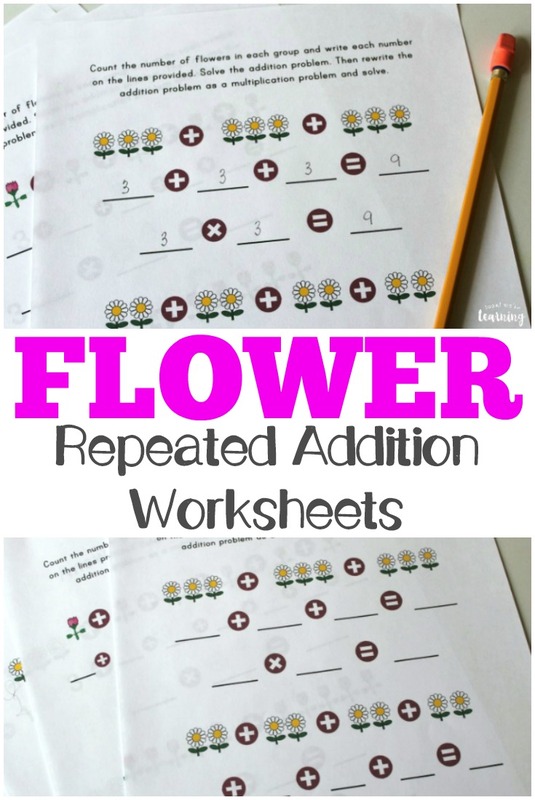 Don’t miss these other spring learning printables! 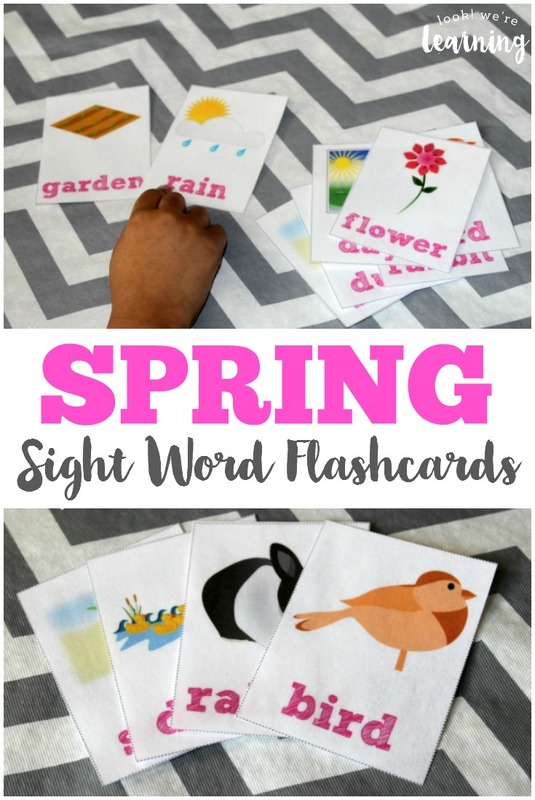 Check out more spring fun for kids on my Spring Activities for Kids Pinterest board! 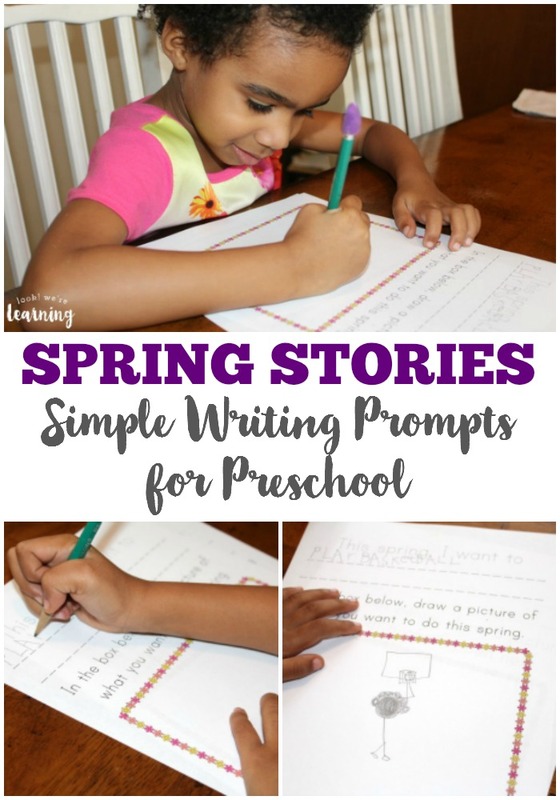 To get your copy of our Spring Preschool Story Prompts free, sign up for our newsletter! 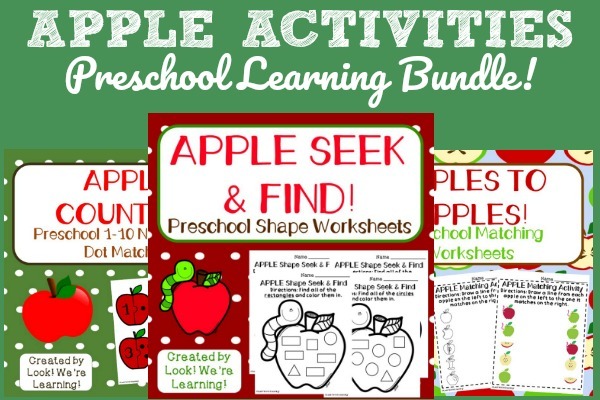 You’ll get these and plenty of other exclusive learning printables when you subscribe! 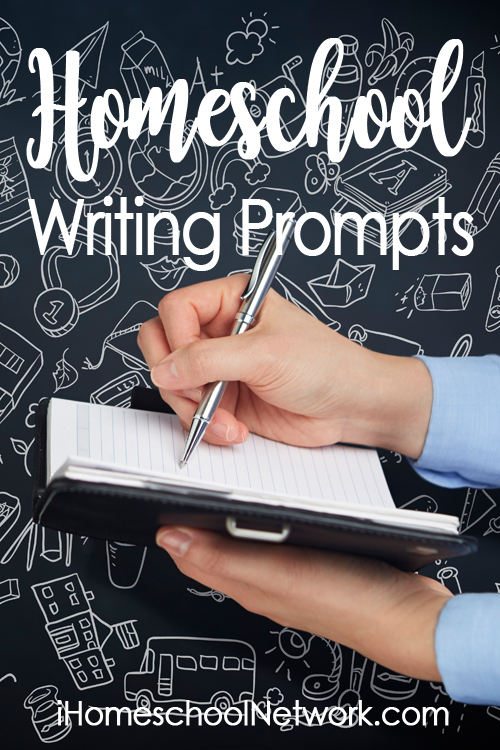 This post is part of the Homeschool Writing Prompts linkup at iHomeschool Network! 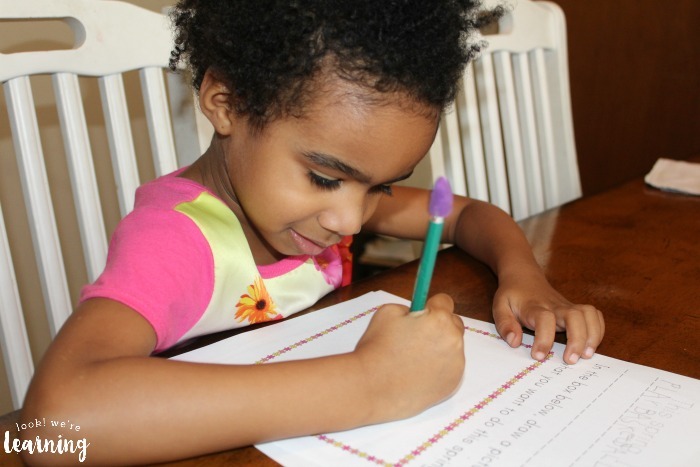 Stop by to get more fun writing prompts for your homeschool from my fellow bloggers!